Title: 07/15/1994 - The coverage of household products in a small group home. Thank you for your letter of June 2 concerning the Occupational Safety and Health Administration's (OSHA) Hazard Communication Standard (HCS), 29 CFR 1910.1200. Your constituent, Mr. Dennis Doughty, requested clarification on the coverage of household products in a small group home. Your constituent indicates he has been informed that it is OSHA policy to require small group homes to obtain material safety data sheets on ordinary consumer products used in such homes by its employees, and to train the employees in the safe use of these products. He notes that while the training is invaluable, there is effort involved in obtaining the needed MSDS and conducting the training, and he urges the policy be changed. In fact, OSHA has no policy that specifically addresses the application of its hazard communication standard in group homes. Employment conditions in group homes vary from establishment to establishment, and the application of standards can only be assessed with respect to the hazards faced by the employees in each establishment. The agency does have an explicit policy of not applying the hazard communication standard to employee use of consumer products when those products are used in the same manner as an ordinary consumer -- i.e., when employees would not be exposed to more significant hazards than ordinary consumers due to duration or frequency of exposure. This policy applies to any employer, including group homes. It is possible that in a very small group home, for example, with only five residents, that the range of exposures encountered by the staff would be no greater than that experienced by consumers for products such as dish detergent or floor wax. In that case, no Material Safety Data Sheet (MSDS) would be required. However, based on the limited information your constituent has provided, it is not possible for us to make such a determination. OSHA could only make this determination through actual observation of conditions of use in the group home and by interviewing the employer and employees. The purpose of the HCS is to ensure that employers and employees have ready access to information regarding the hazards of chemicals used in their workplaces. As you may be aware, OSHA has conducted extensive analyses demonstrating that these information provision requirements are necessary to protect workers from hazardous exposures, and further, do not place excessive burdens on the employer. 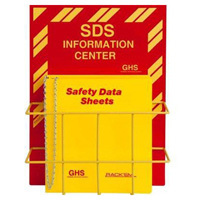 The MSDS contains valuable information on the hazards of a product, particularly regarding safe handling, clean-up, and first-aid procedures. If an MSDS is not received for a product labeled as hazardous, the employer may simply write to the address listed on the label to request an MSDS. Regarding training, the group home does not need to train workers on each individual product. Workers must be trained so that they understand the various hazards of the products they work with and how to protect themselves from these hazards. For example, workers need to understand the need for using household rubber gloves with products which can irritate the skin (e.g., many cleaning products), and the need for ensuring adequate ventilation when using products which are inhalation hazards (e.g., floor wax, solvents). A copy of the amended HCS is enclosed for your reference. We hope this information is helpful. If you have any further questions please contact OSHA's Office of Health Compliance Assistance at (202) 219-8036.